$4.99 to $59.99 & FREE Shipping on orders over $59 $35. Homebrewers know that proper sanitation techniques are critical for creating high quality homemade beverages. 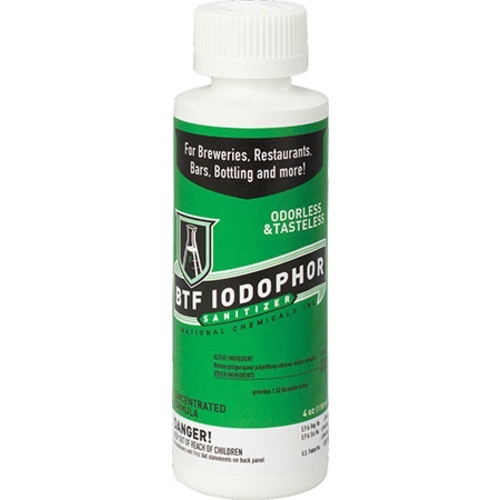 BTF Iodophor, an iodine based sanitizer, is a powerful, broad spectrum antimicrobial product that kills a wide range of bugs that are waiting to infect your fermentation. 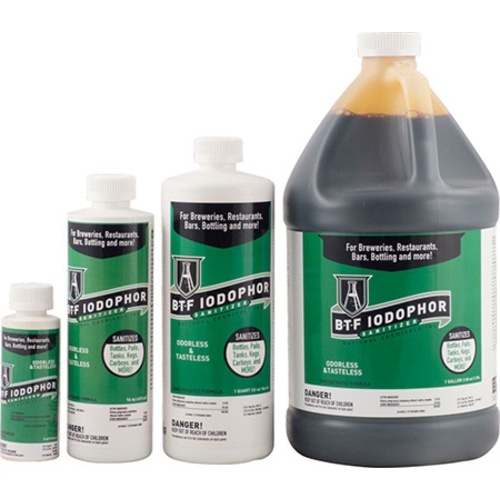 Unlike acid based sanitizers, BTF Iodophor reliably kills yeast, mold, fungus, bacteria, viruses and blood borne pathogens. 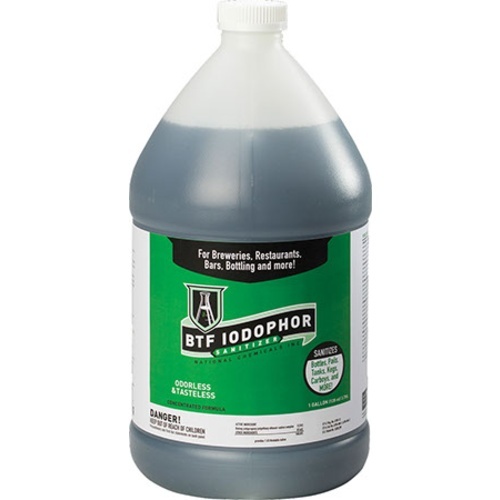 BTF Iodophor offers a low cost per use, is gentler on your hands than other sanitizers, and is very low foaming. If used in the correct dilution (very important) it is a no-rinse sanitizer. It is safe to use on all your brewing equipment such as buckets, kegs, tanks, fermenters, bottles, etc. Even if you frequently use a sanitizer, it’s a good idea to have multiple sanitizers on hand especially when working with wild yeasts and bacteria or as a “change of pace” sanitizer. Allow solution to contact surface for 2 minutes, then air dry. I've used it before and it is the best non-rinse sanitizer I have found! Way cheaper than StarSan. Do the math! This stuff works great and we need more! I like Iodophor because it is so easy to use, is economical, and effective. I've used this product for over 8 years with complete success. Unfortunately, when I opened a recently purchased batch, the smell was stronger than usual. Sure enough, after using it to sanitize my bottles, the beer smells like Iodophor two weeks later. Not happy! Before filling, I allowed the bottles to drain for about 30 minutes, so they were still somewhat wet when I filled them. I've been doing it this way all along, but this time I got a different result. I'll try the beer again in a week or so to see if the smell has diminished. If not, I'll have to dump it. My preferred sanitizer. easy to use, easy to mix up some before hand and store in a airtight dark jug. I’m a big fan of this product and have used it exclusively for years. Doesn’t require a large amount each use and you don’t need to rinse off your items after using. Great sanitizer for the price. Great sanitizer. Used by the pros. Excellent cleaner and sanitizer for your brewery. Doesn’t add any off flavors if left on stainless equipment. We use this product for beer and wine production as well as for sanitizing our Mushroom clean room. No or low odor so it's great to use in small areas. Two thumbs up for killing mold on table or wall surfaces.